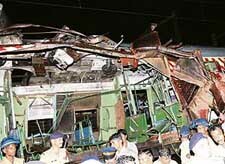 One hundred and forty seven persons were killed and 439 injured in Mumbai in a series of blasts late this evening in seven 'local' trains ferrying commuters home from work and a busy suburban subway. In yet another series of explosions, eight persons, including six tourists, were killed and over 40 others, were injured in six grenade explosions that rocked the uptown areas from Dalgate to the Central Lal Chowk area here today. Is the Congress still committed to the process of economic reforms? In a rare instance, passers- by today caught a suspected militant and handed him over to the police soon after he lobbed a grenade on a vehicle in the heart of this city, officials said. 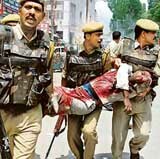 The repeat of 1993 serial blasts in Mumbai today with explosions in seven suburban trains and grenade attacks in Srinagar left the nation dazed forcing the Central government to sound a countrywide red alert after reviewing the security situation in the wake of big toll of human lives. The United States, Britain, Pakistan, Afghanistan and South Africa tonight voiced outrage and condemnation of the Mumbai bomb blasts saying they were terrorist acts designed to strike at innocent people. Railway Minister Lalu Prasad, Chairman Railway Board, Member (Traffic) and Director General, Railway Protection Force left for Mumbai on Tuesday evening after hearing of eight blasts in Mumbai trains. They are expected to reach Mumbai past midnight. The Supreme Court today ordered scrutiny of voluminous records of 13 major Gujarat riot cases by a senior Delhi Sessions Court Judge to determine whether re-investigation by the CBI in those cases is needed and consequently the trial is to be held outside the state. A fresh controversy has erupted in the case pertaining to the alleged sexual assault of a lady Army officer by her senior officers, with the recording of the summary of evidence (SoE) being closed abruptly without all defence witnesses being examined.